Manuscripts should be mailed to journalijar@gmail.com in only ‘.doc’ format. Pdf files are not accepted. Articles can also be uploaded through Online Submission. After receiving the article, an article number will be generated and mailed to the person submitting document within 48 hours. If documents can’t be sent through email, please fill the form on Contact Us page of Website. Every article should be attached with a covering letter including author’s full address with Telephone/Fax Number. Authors have the flexibility of selecting any panel of two to four reviewers for reviewing his/her article, however IJAR, has the authority to designate other reviewers. Regular articles are findings or careful examination of facts and ideas. They contain sufficient detail of the work to make the analysis precise and clear. The length of article should be sufficient to provide complete detail and gist of work. It records Results of investigations, describing new models and hypotheses, methods, techniques or apparatus. The length of short communication is may be around 1000 to 2000 words. Articles are examined by an editorial board of assigned reviewers. The authors are informed of reviewers’ comments within two weeks. Articles may be submitted to editorial board for reexamination. IJAR publishes all accepted articles within 2 weeks of submission. All manuscripts are reviewed by the editorial board and assigned reviewers. Decisions will be made as rapidly as possible, and the journal strives to return reviewer’s comments to authors within 2 weeks. The editorial board will re-review manuscripts that are pending for revision. 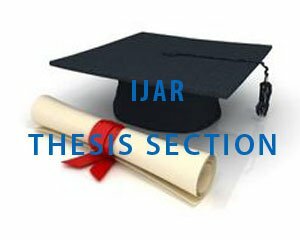 It is the goal of the IJAR to publish accepted manuscripts within 2 weeks after submission. Every page beginning from the first one, should be given numbers and text should be double-spaced. 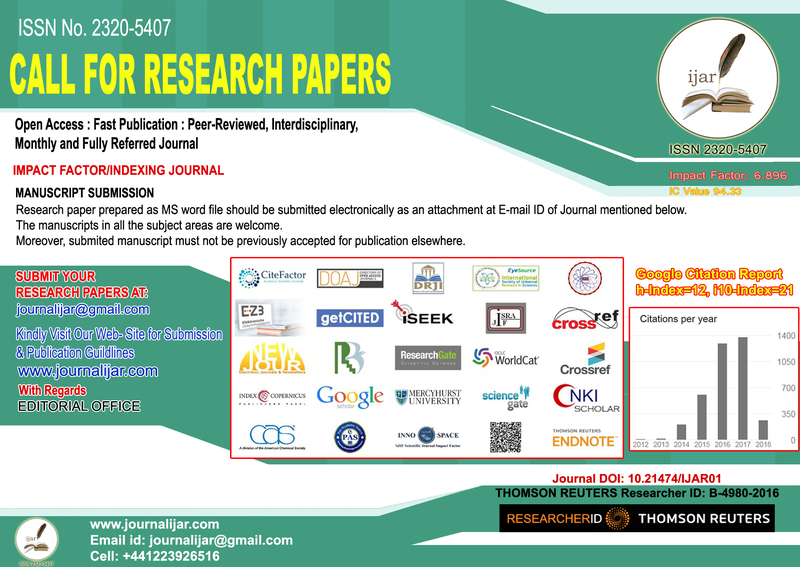 Title should be compact and brief and the title page should contain Author’s full name, affiliations, name of corresponding author, his/her phone or mobile number, fax and email that are necessary for publication on research paper publication sites. Abstract should be precise and self-explanatory presenting topic, state and scope of experiments, including substantial data and indicate observations and conclusions. It may vary from 100 to 250 words. Abstract should be in written in third person and in past tense with complete sentences and active verbs. Abstract should use Standard Nomenclature and not contain abbreviations. From Abstract, 3 to 6 keywords should be given to provide indexing references. The introduction of article contains precise description of problem, literature relevant to subject matter and the proposed strategy and solution. It should be written in easy language, easily comprehensible by colleagues coming from varied disciplines of science. The resources and procedures described should be complete so that the experiments can be repeated with provided descriptions. Whereas the details of previously published procedures are only cited, the description of new procedures should be given at point and the important modifications in published procedures, if any, should be mentioned in brief. Trade Names should be capitalized and the manufacturer’s name and address should also be included. Sub headings should be used as per requirement. Results should be precise and clear. They should describe the observations and conclusions of experiments in past tense. Observations and conclusions, previously published follow present tense. Conclusions are explained largely without any reference to literature. Results should not contain deliberations, assumptions or interpretation of data. These are put in Discussions sections. The discussions are deliberations on observations of contemporary and past annotations on the topic. The conclusion should be described in a few sentences at the end of paper. The results and discussion sections contain subheadings and both sections can also be combined as per requirement. People, contributions and funds etc. should be acknowledged in brief. Tables should be minimum and as simple as possible. They should by typed with double space from heading to foot notes. Each table should have a heading and a story and start on a new page and be numbered in Arabic numerals. Tables should be self-explanatory and without any reference to text. The details of procedures followed in experiment are described in story and not in text. The table or graph and the text should not contain any repeated data. Pictorial stories should be in numerical order on a new sheet. Graphics and Tables should be prepared in MS Word. To label figures, Arabic numerals and for their parts, Upper case letters should be used (Fig 1). Every Story should start with a title and include sufficient details to make figure comprehensible without any need of reading the text. The info given in stories should not repeat in text. References: Reference coupled with author’s name should follow date of reference in parentheses. If authors are more than two, the first author’s name is followed by ‘et al’. If author has two or more manuscripts published in same year, the reference, both in text and in reference list, should be acknowledged by lower case letters ‘a’ and ‘b’ after the date to distinguish the works. Vikas (2008), (Steddy et al., 2012), (Kelebeni, 1983), (Singh and Chandra, 1992), (Chege, 1998; Gold, 1987a, b; Blake, 1993, 1995). References should be given in alphabetical order at the end of paper. Reference list should not include articles under preparation or articles submitted for publication, unpublished observations, personal communications etc. They should be mentioned in article text (e.g., A. Kingori, University of Nairobi, Kenya, personal communication). 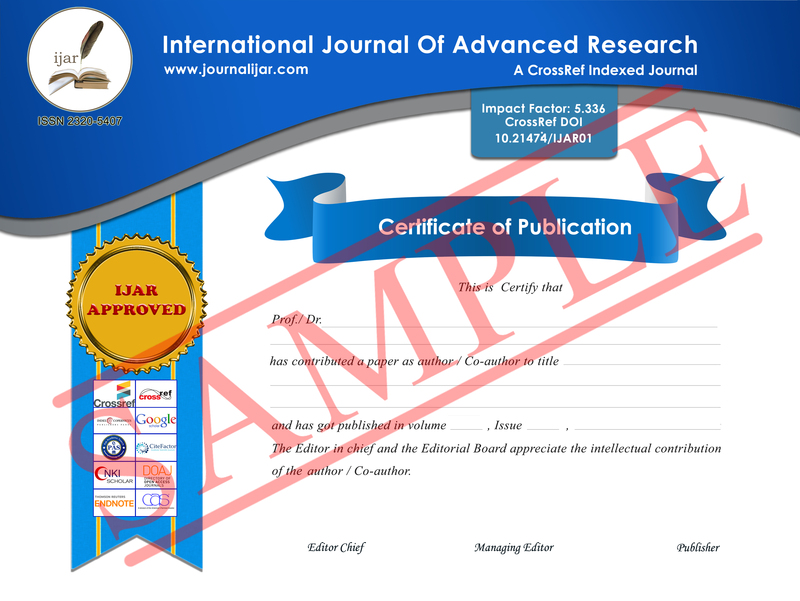 The names of journal are abbreviated as per chemical abstracts. The accuracy of abstracts is the sole responsibility of Authors. Proofs, Reprints and manuscript charges: Electronic proofs will be sent (e-mail attachment) to the corresponding author as a PDF file. Page proofs are considered to be the final version of the manuscript. With the exception of typographical or minor clerical errors, no changes will be made in the manuscript at the proof stage. Because IJAR will be published online, authors will have free electronic access to the full text (PDF) of the article. Authors can freely download the PDF file from which they can print unlimited copies of their articles. The accepted manuscripts will be published online free of cost, but the authors have to pay processing fees only which will be very nominal. Before the accepted paper is published we will intimate the fees in the acceptance letter. Kindly note that ability to pay the publication fee doesn’t necessarily guarantee that the paper will be accepted for publication in IJAR, because we, at IJAR, believe that quality comes first. Only those articles should be submitted that have not been published in past anywhere (except in the form of an abstract or as part of a published lecture, or thesis) or have not been under consideration for publication anywhere. If the article is accepted for publication, author agrees to automatically handover all the copyrights to publisher.